In 1926, the route US 2 now follows was numbered as NE 15 between the New Hampshire state line and West Danville, although just west of St. Johnsbury, NE 15 followed what is now VT 2B. Between West Danville and Montpelier, the route was numbered as VT 18, then numbered VT 14 to Burlington. North of Burlington, the route was numbered VT 4 to just north of Winooski, then VT 30 through the Champlain Islands. At this time, there was no bridge between Vermont and New York. The road surface was improved (not paved) in Vermont and New York. By 1928, US 2 had been numbered in Vermont and New York, but between St. Johnsbury and Montpelier, followed a different path than it does today. From St. Johnsbury, US 2 followed what is now US 5 to Wells River, then what is now US 302 to Montpelier. In addition, between Duxbury and Waterbury, US 2 followed what is now VT 100, River Road, and Winooski Road. The road surface remained improved in most of Vermont, except from Burlington to New York, where the road was paved. 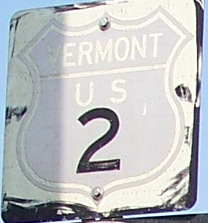 By 1941, US 2 had been rerouted to its current path, except just west of St. Johnsbury where it followed what is now VT 2B. The entire route was paved, and the bridge between Vermont and New York had been constructed by this time. By 1963, I 89 had been constructed between Montpelier and Bolton, replacing US 2 as a major through route in this area. By 1970, I 89 had been completed between Montpelier and Swanton, replacing US 2 as major through route in northwestern Vermont. 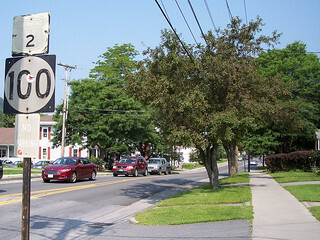 Between 1980 and 1996, US 2 was realigned to its current path just west of St. Johnsbury.